– Now this coming Friday night on Pursuit and Twitch, Johnny IMPACT will not be celebrating his victory, he will be looking for answers and Johnny will be looking for Killer Kross. – Homecoming turned out to be more than just the name of a Pay Per View event, it also marked the return of the Demon Assassin, Rosemary is back. One of the most unique characters IMPACT has ever seen returned to face her one time friend, her “bunny” Allie. However Allie is now Dark and looked as if she saw a ghost with the return of the former Knockouts Champion. What does the future hold for these two women? – What will happen on Thursday night when Konnan reunites with LAX? Find out this Friday night on the premiere episode of IMPACT on Pursuit. 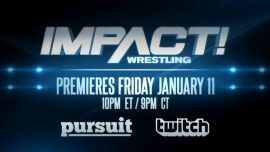 Don’t forget, IMPACT will also simulcast on Twitch every Friday night! Check out more Impact news Right Here.